This dining hall for disabled children care center is a charity project. The design needs to accommodate the function with a very limited budget. The building is conceived as a very basic device responding to most essential elements of nature: rain, wind, sunlight and view. In the main space, a 7.2M long dining table is the daily place for children to eat and play. The veranda facing west provides a passage linking to dormitory building on north, meanwhile function as a sunshade device. On this side, the building is lifted so as to create a terrace for sitting and looking to the central courtyard. Two small courtyards on east side creates an extra spatial layer to the inside. It brings the view and air to make the main space more lively. 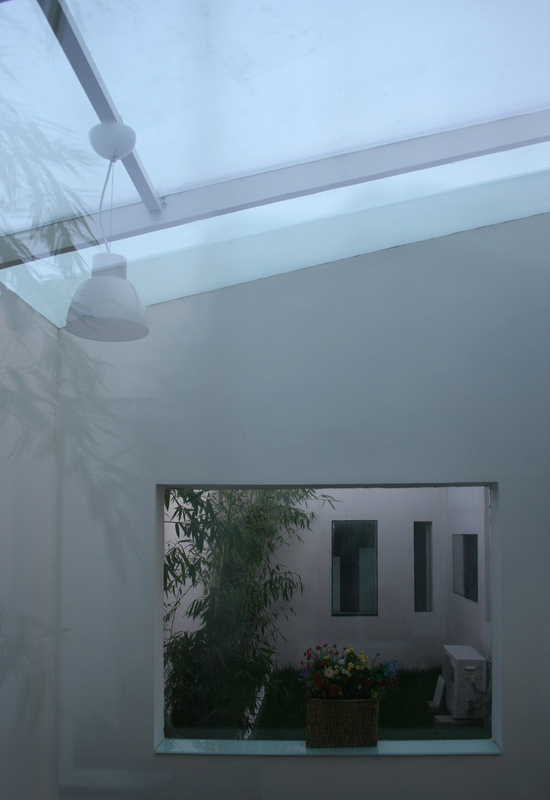 The fixed glass at opening for view and wood window for air is to gain an essential meaning for each element. The changed angle of roof is for better rain draining effect. The economical construction method and material is applied including brick load bearing wall, steel roof truss, corrugated metal roof. Although built in a very low cost, the building is a fundamental return to the essence of architecture, being silent and poetic. Program: dining hall, kitchen, storage, gallery, etc. Site area: 260 sq. m.
Floor area: 180 sq. m.